Marvel has had a long history with monsters. I’ve covered several monster titles from Marvel for previous AWESOME-tober-fests like Tomb of Dracula, Frankenstein and Werewolf by Night. 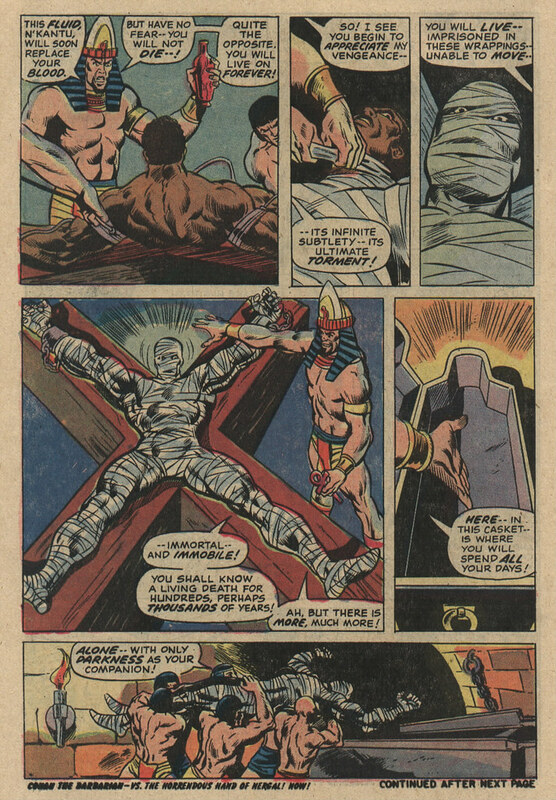 Well, not surprisingly, Marvel also had a mummy character. 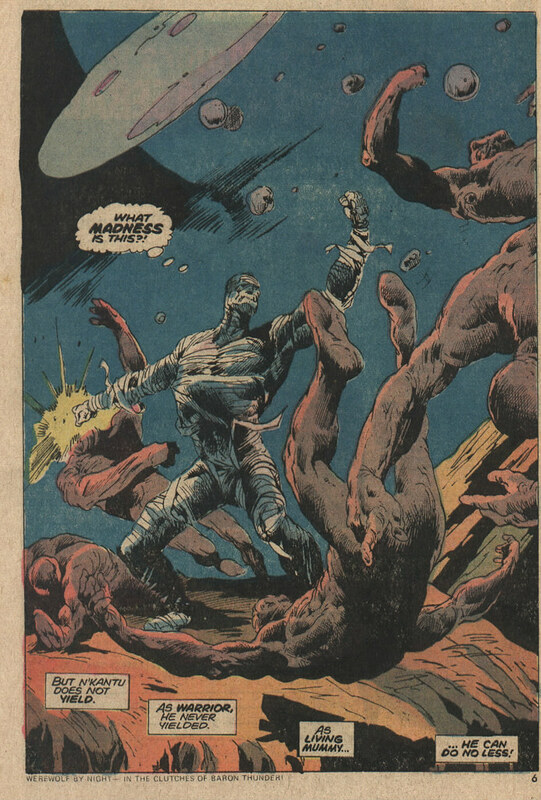 He was called The Living Mummy and he debuted in the horror anthology series Supernatural Thrillers, issue #5, August 1973. You may remember the comic Supernatural Thrillers as I reviewed issue #2 last year which contained an adaptation of HG Wells’ The Invisible Man. The first four issues of Supernatural Thrillers were mostly adaptations of existing work; Stephenson’s Jeckyll & Hyde, Robert Howard’s Valley of the Worm, Sturgeon’s It! and the aforementioned The Invisible Man. With issue #5, editor Roy Thomas had Steve Gerber create a new original character to be run as a feature. 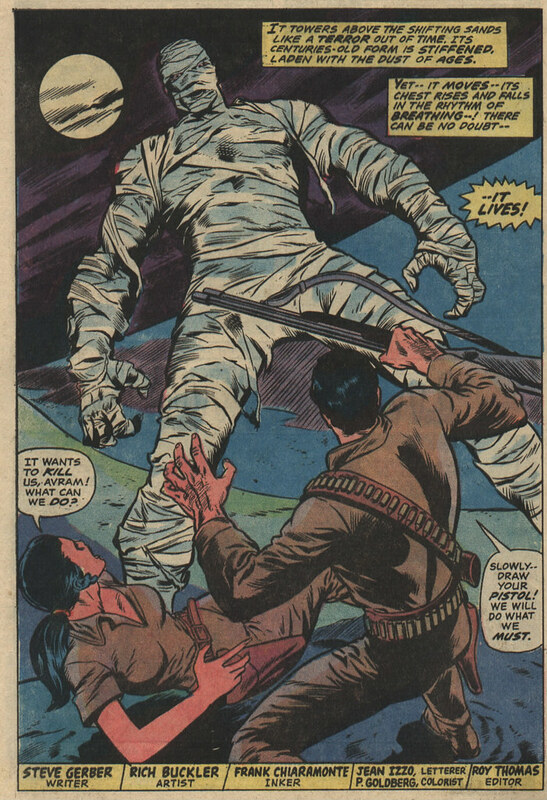 While issue #6 would contain a somewhat sequel to Irving’s Sleepy Hollow, issues #7-15 would solely feature the character The Living Mummy. The Living Mummy started out as N’Kantu, son of the Chief of the Swarili Tribe in ancient Cairo. He is 21 and is preparing to become a tribal warrior by taking the Test of the Lion. While away on a hunt, N’Kantu returns to his tribe to discover that the Pharoah Aram-Set has conquered his tribe and enslaved them to work building monuments. N’Kantu helps plot a rebellion, but his planning is discovered and he is sprayed with a paralyzing liquid that renders him immobile. Then his blood is replaced by a special alchemical embalming fluid, he is wrapped in bandages and put in a coffin to lay, immobile, for the next thousand years. After about a thousand years, the paralyzing liquid wears off and N’Kantu escapes from his coffin, however, he is completely insane due to being trapped immobile in the dark for a millennia. So he goes on a rampage in “modern” Cairo. He gets electrocuted which knocks him out, then is electrocuted AGAIN and is revived. Goes on another rampage. Meets an archaeologist who cures his insanity, but unfortunately N’Kantu is then sent to another dimension. And in this dimension, we get a few stories of The Living Mummy…wait for it…IN SPACE. Yep, he’s trapped in space fighting aliens. Doesn’t get much more awesome than that, ladies and gentlemen. After the mummy shenanigans in Supernatural Thrillers, N’Kantu would break out and guest star in other titles like Spider-Man, Marvel Team-Up and Deadpool Team Up. He made the jump to television in the animated series Ultimate Spider-Man, Super Hero Squad and Hulk and the Agents of SMASH and even joined The Legion of Monsters at one point. 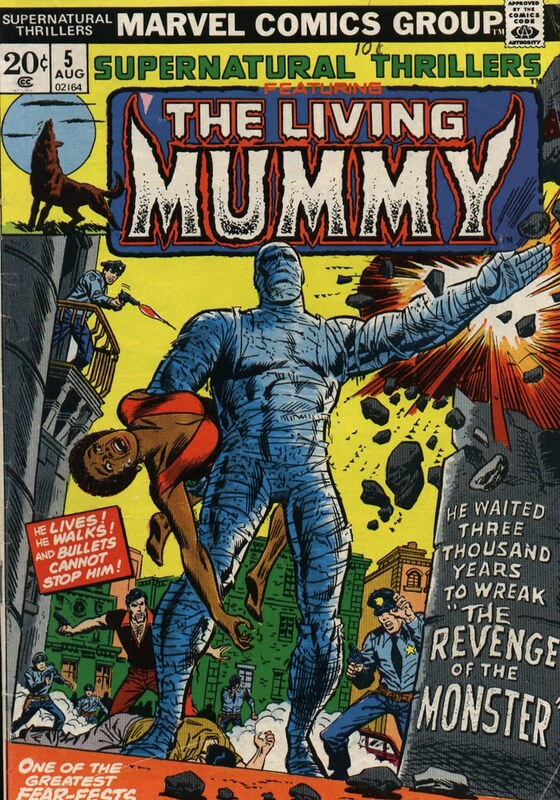 This entry was posted on October 6, 2016 at 8:00 am and is filed under comic books, monsters, mummy, nostalgia, pop culture with tags AWESOME-tober-fest, AWESOME-tober-fest 2016, Cavalcade Comics, comic books, Halloween, holiday, Marvel Comics, monsters, The Mummy. You can follow any responses to this entry through the RSS 2.0 feed. You can skip to the end and leave a response. Pinging is currently not allowed.